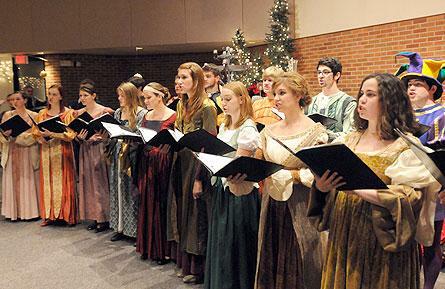 The department of music and Collegium Musicum at Hope College will present the college’s annual Christmas Madrigal Dinner on Friday and Saturday, Dec. 7-8, in the Maas Center auditorium. As in the time of Shakespeare, guests gather at the royal court for an evening of singing, dancing, feasting and general merry-making. The feast will feature fine food, a wassail toast, figgy pudding and a boar’s head procession. The auditorium will be decorated in the manner of a castle’s grand feasting hall, complete with tapestries and suits of armor to help lend atmosphere. The wait staff will be garbed in period attire.